It’s June, Get Your TBR List Ready! Here we are approaching a month that celebrates many happenings. Half the year is almost over, school is out, summer vacations begin and of course on this blog, I celebrate new releases I am excited for. Let me preface this by saying, I probably won’t read all of these books this month. They go on my TBR list and are books I hope my library will stock the shelves with. The purpose of this post is to bring attention to new books, request them at your library. Some are from well known authors and some debuts. In this collection of ten (yes, I pared it down to ten) are five debuts, two short story collections, five are from well-loved authors ranging in mysteries, literary fiction, historical fiction, fantasy and four are about books. All titles will link to full summaries on Goodreads. In The Unlikely Event – Judy Blume (June 2) 432p. It’s Judy Blume and I have a soft spot for her tween/teen books. Although I have never read any of her adult novels, she returns with “a richly textured and moving story of three generations of families, friends and strangers, whose lives are profoundly changed by unexpected events”. Freedom’s Child – Jax Miller (June 2) 320p. This debut thriller/mystery caught my eye with the story of Freedom Oliver. She works in a small town biker bar under witness protection and when a person from her past is in danger, she leaves the security of the government to go back to the life she left behind. The Library at Mount Char -Scott Hawkins (June 16) 388p. I don’t even know how to briefly describe this book about books described as a contemporary fantasy with humor and darkness. It’s also the second book on this list about books! Just click on the linked title. The Book of Speculation – Erika Swyler (June 23) 352p. Another debut that focuses on the love for books. This time Simon Watson is a young librarian and “receives a mysterious package from an antiquarian bookseller.” As he goes through the book he finds information about his family and many questions he wants to find the answers to. Part mystery/historical fiction/magical realism/thriller-and the cover is gorgeous! The Little Paris Bookshop – Nina George (June 23) 400p. Monsier Perdu calls himself a literary apothecary. Isn’t that a fantastic notion? Anyway, this quote did it for me: “There are books that are suitable for a million people, others for only a hundred. There are even remedies—I mean books—that were written for one person only…A book is both medic and medicine at once. It makes a diagnosis as well as offering therapy. Putting the right novels to the appropriate ailments: that’s how I sell books.” Popular in Germany and I desperately hope lives up to my eagerness to read it. What’s on your TBR list for June? 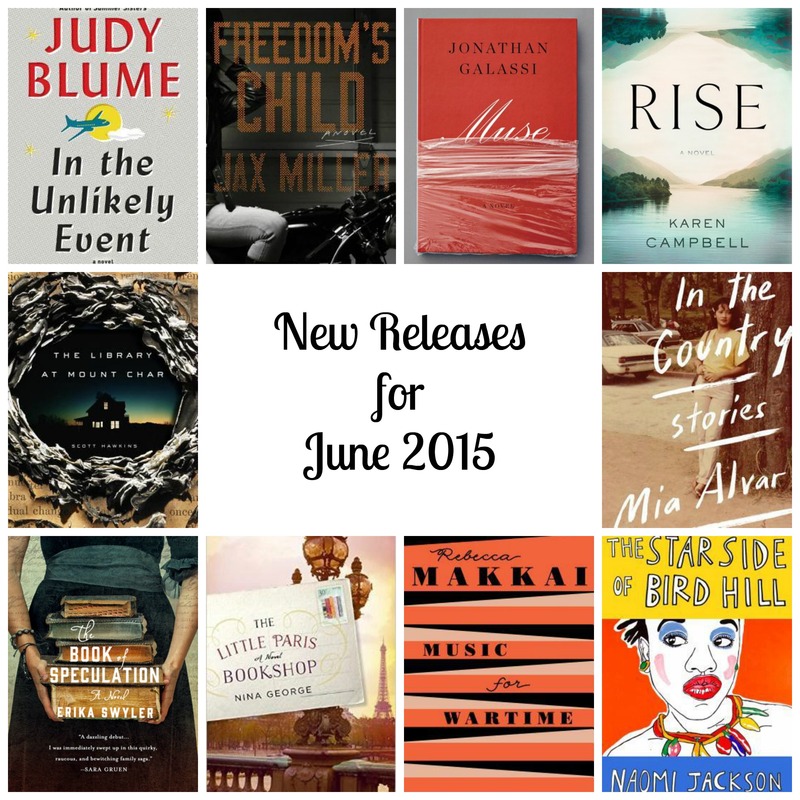 Tags: Contemporary Fiction, fantasy, Historical Fiction, June 2015 new releases, Literary Fiction, short stories. Bookmark the permalink. Oh Muse sounds good and I hadn’t hear of it before. Consider it marked down. But of course the biggest event of the month for me is Judy Blume. Gotta love Blume. I haven’t read any adult books by Blume but hopefully will get to this one! Super excited for many of these, too, especially In the Country – I’ve been hearing great things about it! You know my love for shorts. It’s all I’ve been reading lately. Can’t seem to focus on a novel. I had my eye on Muse, but then decided not to pick it up. Just too many June books! But, if I hear great things then I’ll probably go back to it…I did Chris Pavone’s publishing world thriller, The Accident. I didn’t request any books for June because I have so many others I want to read. I l really liked The Accident! Some great sounding books! I have an e-galley for The Starside of Bird Hill, and am pretty excited to get to it! It really does sound great. Look forward to your review! Judy Blume!!!! I love all of her stuff. I absolutely loved Summer Sisters, if you’re looking for a recommendation for an adult title (even if you weren’t, I thought I’d share anyway). Sadly, I have never read any of her adult books! *Gasp* I have Summer Sisters on my TBR list after you recommended it some time on your blog. Must get to it!! I cannot get my TBR ready, my poor TBR is staggering under its own weight! That being said…there are some great titles here. 🙂 I have to say you really have a great knack for briefly summarizing a book. It’s a great talent to have, I would I could do better at it. Who am I kidding, I wish I could do it at all. I love all of these booking coming about that are about books or libraries or librarians. I had my eye on the Department of Speculation and The Little Paris Bookshop, but hadn’t heard of The Library of Mount Char. Very intriguing!